We’ll always know her best as Sinead O’Connor, but now she’s got yet another new name, Shuhada’ Davitt, and a new religion, Muslim. GLENAGEARY – The Irish singer-songwriter Sinéad O’Connor, also known as Magda Davitt, revealed on Twitter last week that she has ditched Catholicism for Islam and changed her name to Shuhada’ Davitt, Irish Central reported on October 24. “This is to announce that I am proud to have become a Muslim. This is the natural conclusion of any intelligent theologian’s journey. All scripture study leads to Islam. Which makes all other scriptures redundant. I’ll be given (another) new name. It will be Shuhada’,” she tweeted. O’Connor posted a video of herself singing the Azan, the Muslim call to prayer. The video was captioned with: “Here is my 1st attempt at singing the Azan. I got some pronunciation (sic) wrong because emotions took me from my page… but there’ll be hundreds of others onstage to come …,” she wrote. The 51-year-old Irish artist was an ordained priest in a breakaway Catholic sect, and last year she underwent intensive mental health treatment in the US. Why Do Westerners Convert to Islam? Why Do Celebrities Convert to Islam? I Want to Be Muslim: How Do I Convert to Islam? What Really Makes Women Convert to Islam? What is Your Best Advice for a New Eager Convert to Islam? Another tweet from O’Connor said: “My best friend, Elaine just gave me my 1st Hijab and she got chills all over her body when I put it on. Not gonna post a photo because is intensely personal. And I’m an ugly old hag. But I’m a very, very, very happy old hag,” she proclaimed. The singer who made hits in the 1990s is back in Dublin to collaborate with Ronnie Wood of the Rolling Stones, Irish actor Cillian Murphy, Pink Floyd’s Nick Mason and singer Imelda May for a new EP, One More Yard, which pays tribute to a young Irish World War I soldier, Michael Thomas Wall, and uses words from the 90 letters he wrote home during the war. O’Connor sings lead vocals, and proceeds from the project will go to charities raising awareness about cancer. In addition to her ten solo albums, her work includes many singles, songs for films, collaborations with many other artists, and appearances at charity fundraising concerts. The news of O’Connor’s conversion was welcomed by renowned Muslim scholar Yasir Qadhi. 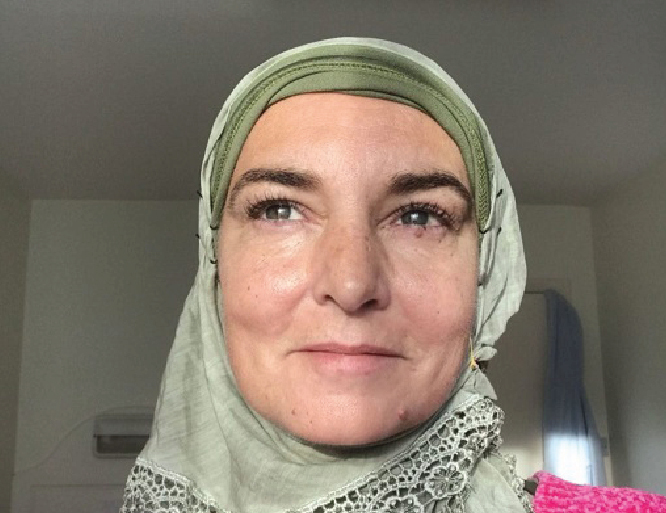 I'm very happy to hear Sinead O'Connor, the famous singer from Ireland, has converted to Islam. She wrote, "This is to announce that I am proud to have become a Muslim. This is the natural conclusion of any intelligent theologian’s journey. All scripture study leads to Islam which makes all other scriptures redundant. I will be given (another) new name. It will be Shuhada’ "
I grew up in the 80's, and while I was never 'into' music, of course I knew all of the famous singers of that time frame, and when one is surrounded by people who are into music, one can't help but know the songs and lyrics (that's my legit excuse btw!!). Sinead always struck me as a deeply religious person, and many of her songs and lyrics displayed that. I vividly remember her anger at the Catholic Church and the infamous incident in the early 90s in which she tore up the Pope's picture on live national television because of the sexual abuses and coverups taking place under his watch. She was always a deep thinker, and so her embracing of Islam is, as she herself realizes, a natural conclusion. May Allah bless our sister Shuhada and make her a role model for her people, and all of us! According to 2015’s international estimates, there were 1.8 billion Muslims in the world, with one out of four humans being Muslim, making Islam the 2nd largest religion in the world. According to a 2016 study by Pew Research Center, “0.3% of the global Muslim population growth in the period of 2010–2015 was due to conversions, while 99.7% of the global Muslim population growth was due natural increase. In non-Muslim countries like the US, the New York Times estimated that 25% of American Muslims are converts. In Britain, around 6,000 people convert to Islam per year. According to Pew Research, 77% of new Muslim converts come from Christianity, whereas 19% were from atheism. On the other hand, 55% of Muslims who left Islam went to atheism, and 22% converted to Christianity.